Firstly, many thanks to those of you who have joined the Trade of Shame campaign aimed at stopping the illegal dog meat trade from Thailand to Vietnam. I am pleased to be able to advise you that thanks to your support progress is being made, and the dogs at Thong Pha Phum (Kanchanaburi) have hope. Through your support Soi Dog’s team has sterilized a further 348 dogs at Khemmarat and Buriram, which will help to ensure no more unwanted puppies are born in these centers. Friday, upon Soi Dog’s request a team from Mahidol University visited Thong Pha Phum and carried out essential treatment on injured dogs. Soi Dog’s Khun Toon, together with volunteers from Dog Nation also have carried out additional sanitation operations and this will continue over the coming weeks. 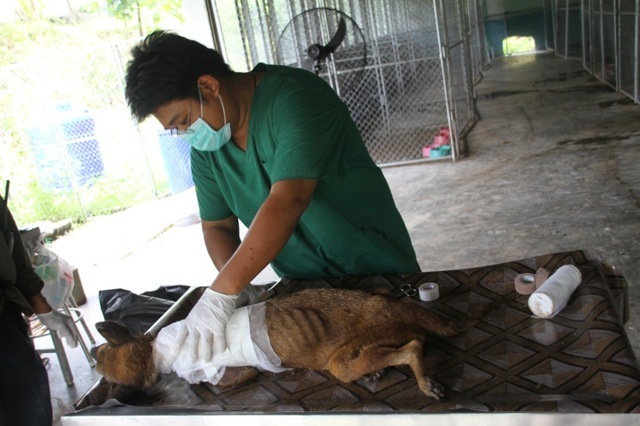 A veterinarian accompanied the team to carry on the treatment started on Friday by the team from Mahidol University. Next week Soi Dog’s relief coordinator Khun Toom will accompany Soi Dog President Dr. Suchon Jittanonta to Thong Pha Phum to discuss strategy with the head of the Livestock Department for the region and his deputy who is managing the shelter. The following day a meeting is scheduled with the Chief of the Department of Livestock in Bangkok. The Livestock Department has been given the task of caring for the animals but because dogs are not considered as livestock there is no budget for their care. Hence it is only with your support that this important work can continue. The staff and management at the centers do the best they can, but with no budget are extremely limited in what they can do, which of course as you read in my previous letter has resulted in the majority of the dogs rescued from the smugglers in the past 12 months dying from disease and malnutrition. Approximately 100 dogs from the dog meat trade currently at Thong Pha Phum are the sole survivors of nearly 2,000 dogs seized from a holding area in Ban Tharae in January of this year. We cannot stand by and see this repeated with the other dogs currently being rescued. However the costs are enormous, just to provide food for the dogs currently being housed in the 4 centers is costing hundreds of thousands of baht each month. Soi Dog has committed an additional 2 million Thai baht to improvements and staffing at Thong Pha Phum but it is essential that the local livestock department are willing to cooperate in our plans. The Department of Livestock have now agreed to allow volunteer overseas vets to assist there and a team from the UK will arrive mid November followed by a European team shortly after. If these trips prove successful we will, subject to availability, be sending additional overseas vet teams on a regular basis both to Thong Pha Phum and to Khemmerat who have also agreed to the proposal. In November Soi Dog is sending a civil engineer to Thong Pha Phum, Buriram and Khemmarat shelters to assess the requirements to install proper drainage and other required works to ensure that hygiene is improved and reduce the risks of disease. We have received plans from Buriram requesting us to build a new shelter there which would be a huge investment but we will only do so after a thorough review of the plans and assurances that the shelter would be used for Dog Meat Trade dogs and not as a local dog pound which is contrary to Soi Dog’s policies. As you can no doubt appreciate the costs of doing this are huge and totally outside of our normal operating budget. Our normal work of sterilizing and caring for dogs in Phuket and now Bangkok continues to expand and must continue at the same time. These dogs can only be saved through your support and this is a long term project. If you have not already please consider becoming a monthly donor to The Trade of Shame campaign. 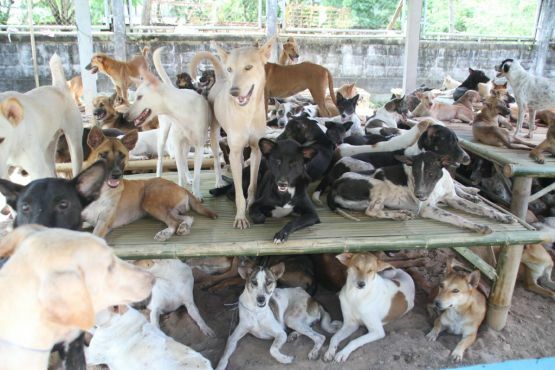 Many thanks from Soi Dog and the dogs of Thailand! P.S. Your support is crucial in bringing an end to the illegal live export and inhumane treatment of Thailand’s dogs! 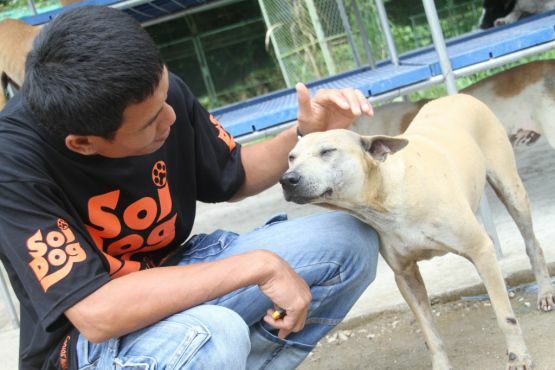 United States residents, Soi Dog is a registered charity in the USA and your donation is tax deductible to the full extent allowed by US law. 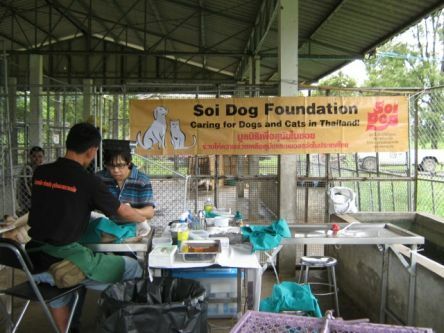 United Kingdom residents, Soi Dog is a registered charity in the UK and your donation qualifies for HMRC gift aid.